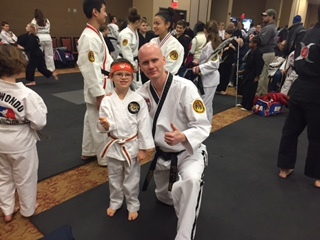 Students from West of the Moon ATA, located in Oswego, IL competed in a martial arts tournament in Bloomington, IL that took place on January 10, 2015. OSWEGO, Ill. - Jan. 11, 2015 - PRLog -- Several students from West of the Moon ATA, a martial arts school located in Oswego, IL, attended a regional tournament in Bloomington, IL over the weekend. Approximately a dozen students from West of the Moon ATA ended up competing. "I wish that we had more people competing from our school. Unfortunately, the weather was a factor," school owner Nick Zorn explained. Several other students had expressed an interest in participating, but due to the severe weather over the last few days, they had to pass. Overall, the tournament went well for the Oswego competitors. Several students dominated their divisions. "We have some really great students at our school. They work extremely hard and it shows," Zorn said. Two of the students that competed are parents of younger students. "It's great to see adults getting excited about martial arts," Zorn said. "We have several families that train at our school together. It's a great way for families to bond." The tournament was hosted by Master Corey Coffrin of Coffrin's ATA Martial Arts Academy. The tournament was held at the Parke Regency Hotel and Conference Center in Bloomington, IL. The next regional tournament is March 6-7, 2015 in Lynwood, IL. It will be hosted by Mr. Keith Shoup of Countryside, IL.